DES MOINES, Iowa — On the surface, the only hitch in Democratic candidate Julián Castro's most recent trip to the first-in-the-nation Democratic caucus state was a snowstorm that mucked up his travel schedule. Once he arrived here Sunday for a two-day swing, Iowa Democrats treated him to all the trappings of a serious presidential contender: He was a guest on a podcast taped before a standing-room-only crowd at the University of Iowa campus, he made the rounds of the state capital and his schedule was packed with events. Yet there was an underlying problem that emerged during the trip, one having nothing to do with school tours and meet-and-greets. On Monday, it became clear that Castro had come in dead last in fundraising for the first quarter among the 15 or so candidates he is hoping to appear alongside on the first debate stage in June. While it's natural for a candidate to downplay bad news, Castro emphasized a silver lining. "Right now people have lower expectations for me, but that’s also an advantage in April of 2019," Castro said in an interview in downtown Des Moines. "My vision for this campaign is for my expectations and my performance to cross over with the people who have higher expectations toward the end of the year." It's true that no one expected Castro to out-raise heavyweights like U.S. Sens. Bernie Sanders and Elizabeth Warren. But Castro, a former U.S. housing secretary and San Antonio mayor who was the keynote speaker at the Democratic National Convention in 2012 and was on the shortlist to be Hillary Clinton's running mate in 2016, reported raising just $1.1 million, falling short of more obscure figures on the national political scene like businessman Andrew Yang and self-help author Marianne Williamson. Castro's haul for the quarter was about one-fifth of what that other Texan in the Democratic presidential race, Beto O’Rourke, raised in his first day on the trail. And another fellow Texan, Republican U.S. Sen. John Cornyn, raised more than double Castro's intake over the first quarter for his re-election bid — a race in which Castro's twin brother, U.S. Rep. Joaquin Castro of San Antonio has said he is giving a run serious consideration. The candidate shrugged it all off, noting that most recent presidential primary contests have proven to be boom-and-bust affairs with contenders exploding in interest only to wilt under early scrutiny. Timing, he said, is everything, and he is comfortable playing the role of a sleeper at this point. In order to make a viable play for the nomination, Castro's job, for now, is to wait for a breakout moment on national television and campaign hard here in Iowa. And mostly, to keep the lights on. For now, this means pounding the pavement in the state's Democratic bastions. 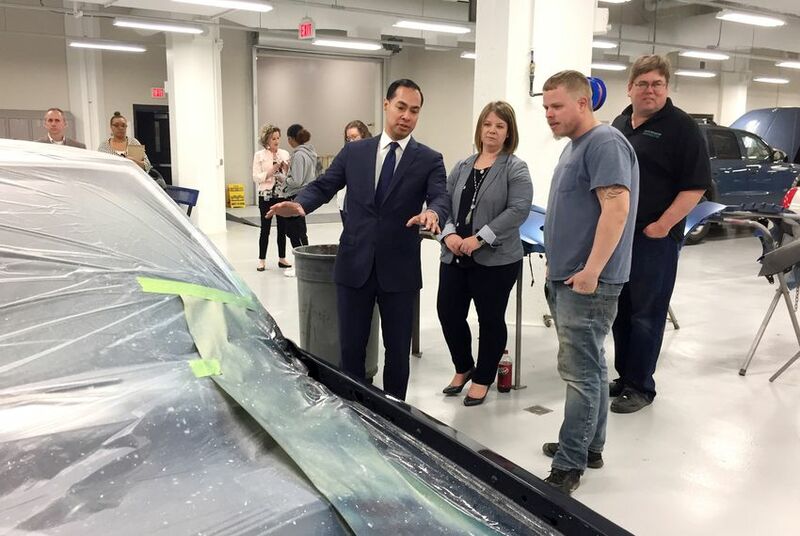 During his stop in the college town of Iowa City, Castro leaned on his time at the U.S. Department of Housing and Urban Development and spoke authoritatively on the issue of homelessness. On Monday, he toured a Des Moines technical high school that is a national model for trade school education. He later held meet-and-greets, including an Asian and Latino Coalition reception at a local machinists' hall. Castro's team noted in its campaign fundraising announcement that the pace of his donations has accelerated in the new quarter that began April 1. On tha day, Castro released his well-received immigration plan, which includes a call decriminalize illegal border crossings. Then came a busy stretch for the candidate that included a counter-rally to President Donald Trump's visit to his hometown of San Antonio and an hourlong appearance at in his own CNN town hall. Castro's fundraising has ticked past the $2 million mark. “It’s still very early in today’s political environment. Things can change in the course of a few days, so I’m not worried about that at all right now," he said. The more existential question to his campaign is whether Castro will qualify for the June Democratic primary debate. Given the expansive field, the Democratic National Committee is only making room for candidates who reach 1 percent in three national polls and draw 65,000 donors from 20 states. Castro's campaign said last week that it's received donations from about 50,000 donors. A national Emerson poll this week has him at seventh place with 3 percent support. As for his ground game in Iowa, Castro is beginning to build out his infrastructure, and he recently hired two state-based staffers. "The people here in Iowa take their politics very seriously, and they pay attention," Castro said. "Since it’s not a huge state, retail politics is still important. And since there are 19 or 20 candidates, it’s going to be important for people to get out and connect with voters in intimate settings. And I intend to do that." Along with campaigning hard in other early states like New Hampshire, South Carolina and Nevada, Castro is also following through on a pledge to visit all 50 states over the course of the campaign. He'd checked off about 10 states as of Monday and was headed to Chicago on Tuesday to speak at the University of Chicago's Institute of Politics, which is run by former President Barack Obama's political adviser, David Axelrod. "Because there’s so many people in this crowded field, the chances are that the nomination process is going to go deeper than it usually does, and so states that people may have not thought were going to be vital ... in most cycles will actually may well make a difference," Castro said. But for those planted seeds to blossom, he will have to perform well enough in the early states to survive long enough to make those other states. Are these two strategies mutually exclusive? Everywhere he went in Iowa on Sunday and Monday, he jokingly reminded audiences that the caucuses were "only 43 weeks away." Ten months is a lifetime in American politics. And Castro hopes that time is on his side.